The bridge at the top of Wainui hill is up! Watch this rather glorious time lapse video to see it swing into place. The bridge, named Pukeatu (Summit of the Gods), was swung into place over the hill road overnight on 29 September. The bridge will be opened for walking and cycling some time in October. The construction of the bridge is phase one in the Wainuiomata cycleway project, which received $1.5m from the Government’s $100 million urban cycleway fund. The project will provide a shared cycling and pedestrian path connecting Wainuiomata with the wider Hutt Valley. The bridge will provide safe access to walking and mountain biking trails, and remedy the long lack of a safe connection between Wainuiomata and the Hutt Valley for people travelling on foot or by bike. We have the money – do we have the vision? Wellington CBD Cycleways – an achievable vision? Following hard on WCC’s approval of the Cycling Framework, and the Island Bay Cycleway, the Government announceed another $296 million to be spent across the country under the Urban Cycleways Programme, bringing the total expenditure, including contributions from the National Land Transport Fund and local government, to $333 million. $53.32 million is to be spent in the Wellington Region. There are good reasons for this largess. By making cycling an attractive transport choice, we reduce fossil fuel emissions and urban congestion, and promote health lifestyles. This benefits people who need to drive cars, as well as people who bike. In Wellington we have a real chance of implementing a vision of a “cycling capital”. As NZTA notes, “Since 2006, the number of people commuting by bike in the capital has almost doubled”. Wellington’s narrow streets and steep hills have traditionally been barriers to cycling. But narrow streets make for cycle friendly speeds. Mountain bike gearing and eBikes have made hills much less of a problem. City Councilors bought into this vision when they unanimously approved the Cycling Framework. 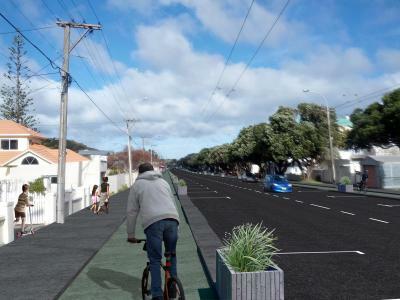 But as the vote on the Island Bay Cycleway showed, actually implementing this vision is not easy. Constructing cycleways almost certainly means change for people and businesses along the routes. Parking is affected, and people may have to keep an eye out for cyclists as they cross a kerbside bike lane to get to their car. 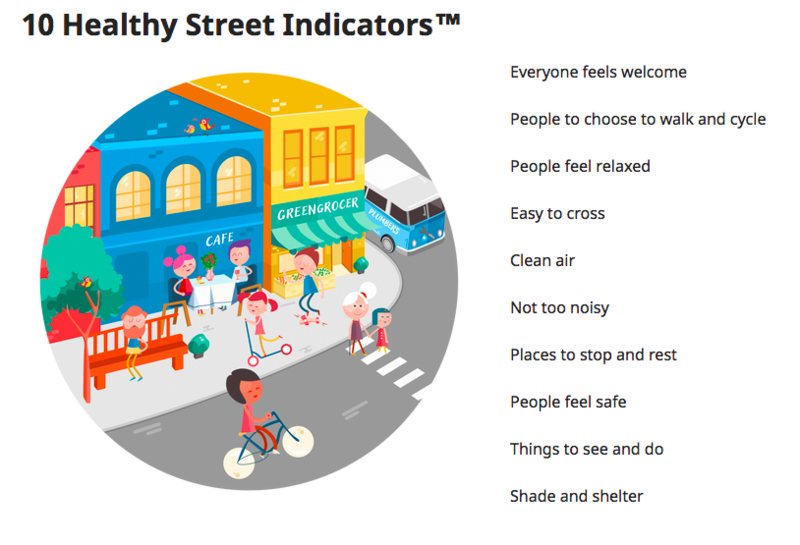 But no street environment is static. In my own street, we no longer have easy access to on street parking. This isn’t because of cycleways, but because our neighbors have acquired multiple cars per household, and commuters take advantage of the free parking within walking distance of the CBD. The challenge for our City Councillors is to see the bigger vision of Wellington as the Cycling Capital of the South Pacific, and spend the Urban Cycleways money on projects that ultimately will benefit all of us, even if this means short term change for some. Wednesday’s Council meeting saw three big wins for cycling – approval for the Cycling Framework, and the go-ahead for the Island Bay Cycleway, the first stage of the southern cycle route from Island Bay to the CBD. Also a cycling budget of $58 million over 10 years was approved in the Long Term Plan. The Cycling Framework was approved unanimously – as one comment on Twitter said “Councillors now clambering over each other in their enthusiasm to be on the cycling working party!”. so there’s no doubt that Councillors are keen to be seen as pro-cycling. Against: Ahipene-Mercer, Coughlan, Eagle, Marsh, Woolf, Young. Although Councillor Ritchie spoke in the debate, she was absent for the vote. Where to now? It’s important to complete the Island Bay to CBD cycle route, but another high priority route is the Thorndon to Ngauranga Cyclepath – this has high usage and a poor safety record. An indication of the issues on this route came in the public participation for Wednesday’s Council meeting. A business owner on Thorndon Quay was keen to see the Thorndon to Ngauranga Cyclepath routed along Aotea Quay – so that she didn’t lose parking outside her business. Cycle Aware Wellington media release. If you cycle enough you might even be able to understand this article that found cycling increased “brain-derived neurotrophic factor (BDNF)”, one of “a family of neurotrophic factors that participates in neuronal transmission, modulation and plasticity”. So ride your bike to increased neurological function!! Now I finally understand what I suspected all along, my bike must be why I am so clever and happy! Loving this letter in the DomPost last week. Thanks Carl! After a couple of terrible years, it’s good to see fewer people were seriously hurt while cycling on Wellington region’s roads last year. Given the increase in cycling, our crash rate per km cycled must have taken a dive, too. Wellington took a big step forward today to becoming a cycle-friendly city, says James Burgess, Chair of Cycle Aware Wellington. “I am stoked that our city council unanimously approved the cycling budget of $4.3m,” he says. For context, roading gets $69m. James says huge thanks are due to everyone who worked over the past decade to get us here. While I don’t like posting about cycling deaths, I feel that it is worth sharing some of the comments made after the recent death of a cyclist in Parnell. It isn’t clear what happened yet, but having cycled through this intersection a few times last year, I can say it is pretty darn scary – I opted for riding on the footpath – and it is clear something needs to be done about it. It’s good to hear some assertive language being used with regards to the need and demand for proper cycle infrastructure. It’s sad that another persons life has been lost, because councils and roading authorities have been mucking about, prioritising anything else (trucks getting from the port to the motorway in this case) over peoples safety. It’s worth reading the Cycle Action Auckland post and also the blog post by entrepreneur Lance Wiggs, who arrived at the scene soon after the incident. I’ve quickly pulled some salient quotes from these posts, in case you don’t have the time to read these articles in full (below). We keep hearing that cycle facilities will be built “soon”, or “this summer” (the latest undefined date) but things get pushed back and nothing happens. Will the same thing happen again? This is an impossible state. We used to say “somebody has to be killed for something to happen” – do we have to change that to “somebody has to be killed for people to notice that nothing happens“? …As we said, it is not clear yet what caused Tuesday’s cycle death. However, whoever or whatever cause is to blame, our cycle injury and fatality levels are way too high, SEVERAL TIMES above the best-practice rates from Europe. It’s an election year, and this is a great time for all parties and candidates to take a tough stand. Cycling and work safety are not Green, Red, Blue or other party-affiliated issues, but ones that offer benefits across the board. Improving cycling safety and work safety generates more retail and manufacturing revenue, saves on medical expenses, prolongs lives, saves money for individuals and families and delivers better environmental outcomes. It’s cheaper than building roads and rail, and will make it far safer for our children to walk and cycle to school. It seems obvious, and will attract a decent number of voters looking for a better life. It’s a great time for us voters to ask the candidates and existing MPs what they are doing about safety on the streets and work, but we also need to ask and apply pressure to the recently elected mayors and councillors to follow through on their promises. I am particularly concerned with Auckland and Wellington mayors and councils, who have delivered little for cyclists on a mandate of change. Too many people are dead and I think we would all like to see a genuine sense of urgency before more people die. 2014 – a great year to get on your bike! Happy New Year from Cycling in Wellington! Start off the year right by getting on your bike. Greater Wellington Region Council’s awesome “Active a2B” programme has just kicked off and will help you achieve your active commuting goals for the year. Register for Active a2b today! Back at work or soon to be back at school but dreaming about getting away again? Sign up to Active a2b and you can get away on a daily basis! Incorporating walking or cycling into your commute is one way to have a little holiday each day. Take the scenic route, breathe a little faster and get the endorphins pumping. • Tools to support your efforts: a desktop calendar to record your progress, a goal magnet to keep you on track, a bike buddy scheme to get you started, an online journey planner, cycle workshops and more! • Discounts: at participating stores; on local event entries and on quality pedometers. • a2b Go: the four week active transport challenge with great prizes. • Motivation to keep it up: a regular newsletter sharing inspiring stories from fellow participants, individualised phone support, a Facebook community and great prizes. You don’t need an app for this – a bike or some shoes will do. Just click here to start the journey!